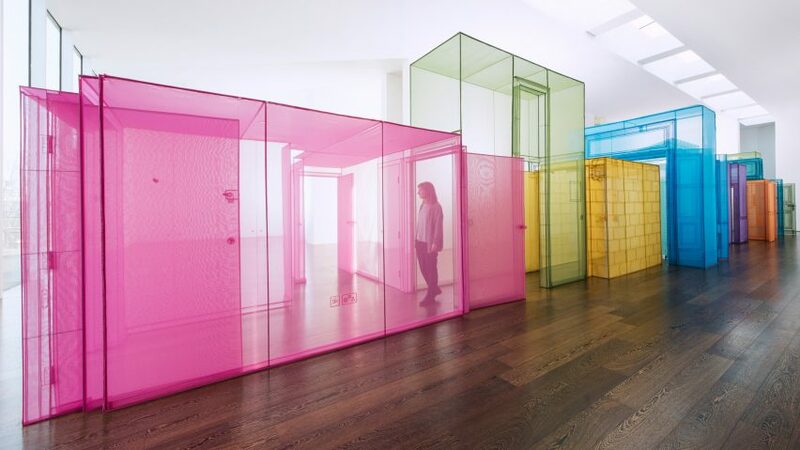 Korean artist Do Ho Suh references the different places he has lived and worked with this colourful installation at London's Victoria Miro Gallery, which explores ideas about identity and migration. The Passage/s exhibition gives physical form to Suh's idea of life as a journey – his installation is designed as a sequence of passageways that each represent a different place he has occupied. "I see life as a passageway, with no fixed beginning or destination," said Suh. "We tend to focus on the destination all the time and forget about the in-between spaces." The main part of the exhibition is a one-to-one scale structure made from panels of colourful translucent fabric, named Hub. Each section references a different place that the artist has lived and worked, including his childhood home in South Korea, and various apartments and studios since then. Following his move to London five years ago, Suh created the Hub, London Apartment structure, which is a partial representation of his home in the UK capital. This section is joined with nine other structures, which come together to create a walk-through installation spanning the length of the 25-metre-long gallery. "To move through these delicately precise, weightless impressions is to experience a distinct emotional register, a sense of being in flux, crossing boundaries and moving between psychological states," said the gallery. This theme is also explored in animations displayed around the installation, in which photographs of various locations have been digitally stitched together. One of these works came about following the birth of Suh's first daughter. The artist attached three GoPro video cameras to her pushchair to capture the different viewpoints and sound from the street, along with conversations between father and daughter in English and Korean. A recently-completed work named the Rubbing/Loving Project, is also on show in the gallery. Made over the past three years in the New York apartment Suh first moved into in 1997, it was created by lining every surface of the interior with paper and taking a rubbing using coloured pencils and pastels. His departure from New York is visualised in a set of works displayed within lightboxes, which are a series of household items constructed from white fabric. The exhibition also introduces Suh's new process in which his architectural structures are compressed into large-scale two-dimensional pieces. Using gelatin tissue, the works are sewn together. But once immersed in water, the gelatin dissolves and fuses with the paper to leave an image where the threads appear as a framework of the form. Passage/s is on show at the Victoria Miro gallery in north London until 18 March 2017. It follows on from British artist Alex Hartley's exhibition, for which he installed crumbling modernist ruin in the gallery's gardens.